Announcement State of the art motorcycle accessories that include but not limited to saddlebags, handlebar tool-bags, fork wraps, swing-arm bags, sissy bar bags, tank panels, fender bibs, mud flaps, fork bags, leather cuff bracelets, custom belts or anything else that you would like us to make from leather for you or your motorcycle. Please contact the shop owners before placing your order. 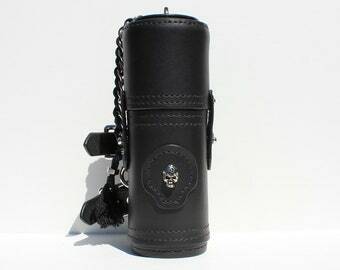 State of the art motorcycle accessories that include but not limited to saddlebags, handlebar tool-bags, fork wraps, swing-arm bags, sissy bar bags, tank panels, fender bibs, mud flaps, fork bags, leather cuff bracelets, custom belts or anything else that you would like us to make from leather for you or your motorcycle. Please contact the shop owners before placing your order. Arrived in excellent time and communication was great! Very pleased!!! 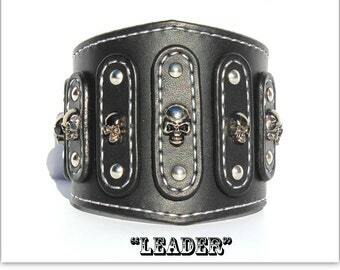 Place your order for the most popular "Leader" bracelet today . 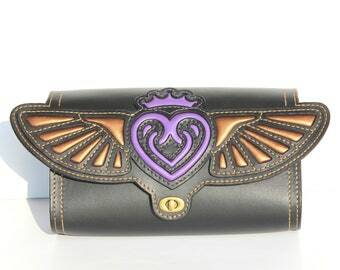 This is one of the custom orders that we've completed for our customer. Started from design development and sketch and finished with the final product. 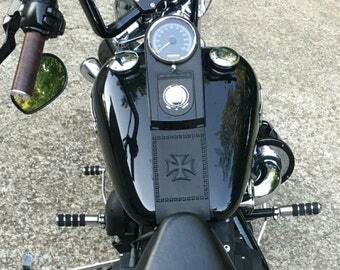 And here is what customer said: It looks AWESOME!!! Wow, I'm very impressed. Thank you so much. Beautiful bracelet for teenage girl. It was actually designed by our 10-year old niece and we named it after her. Place your order for "Meela" bracelet today. The price is what you pay, the value is what you get! 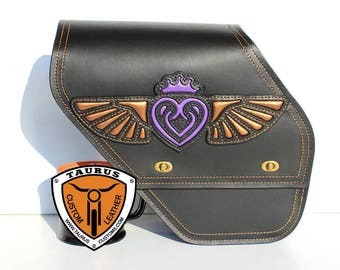 Taurus Custom Leather is specializing in custom motorcycle and bikers accessories. - custom stylish biker accessories made from leather & chains for men and women, such as biker wristbands, wide leather cuffs, belts, decorative belt chains, and other. Our Etsy Shop represents our line of stylish bikers accessories designed and handmade by the shop owner Alex - highly skilled artisan and real biker. We do not mass produce items, we take custom orders. Please contact the store owner if you have your own design in mind, and would like us to make a unique one-of-a-kind piece for you. Alex was passion about motorcycles since childhood. He always dreamed to own a Harley-Davidson. 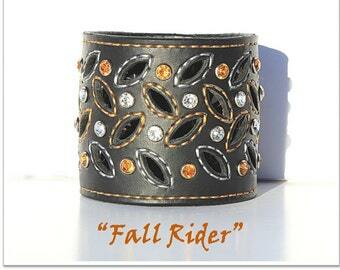 We he got one, he started making leather goods for his bike, himself and his wife. Later on, his hobby developed into the very successful business. Anna is the one who stands behind the whole shop and business idea. She is doing marketing, customer service, bookkeeping, purchasing, research and everything else. She is the one who inspires Alex on his amazing work for more than 25 years now. Thank you for visiting Taurus Custom Motorcycle Accessories Shop! We are here to help you creating very special one-of-a-king accessories for you or your motorcycle if you have one. Do not have one, no worries, nobody is perfect :) We will make an accessory just for you, which will make you so noticeable that no one will pass by without asking where you got it. We work with our customers in very close collaboration, discussing every aspect of the project. Send us a Custom Order Request, and you'll be amazed by our customer service. We stand for our products and guarantee the highest quality. We are sorry, but we cannot provide you with the refund on custom orders. All custom orders are discussed in details. We start the manufacturing process only after receiving your final approval. We will never send anything to you with any manufacturing defects. Before we ship, we will provide you with high resolution pictures to insure that your product does not have any defects and you are fully satisfied with its quality. We are not responsible for the loss or damage done by the Canada Post. If you would like to include the coverage for your item, we can update the shipping cost by your request. Coverage for every $100 CAD costs $2 CAD. So if it gets lost, we will refund you up to the amount of the coverage that was included into the shipping cost. Please contact us before placing the order. Returns are accepted on Ready to ship items within 14 days from the delivery date. If you are not satisfied with your purchase, please ship the item back in the original condition at your own expense and we will refund you the cost of the item. Your understanding in this matter is much appreciated! We accept all type of payments via direct checkout, including Etsy gift cards and PayPal payments. Buyers can now pay with credit and debit cards, Etsy gift cards and other international payment methods. We use Canada Post services for shipping. We could ship Internationally, however, the cost for the small package with the tracking number is so unreasonably high, that we do not publish it on our shop page. If you are willing to pay, we will send you an updated invoice with new shipping charges. Please let us know how much you are willing to pay for the coverage. In case the package get lost, we will refund that amount to you. Please note that seller in not responsible for any customs duties charges. Buyers are paying any local taxes, customs duties, or brokerage fees. We reserve the rights to use photos of any custom made items to promote our shop as well as our business outside Etsy web-site, on social networks, photo sharing sites, and other web-sites.